...after which the economic climate improves until the next 8.6 year crisis point. Hence, while earnings growth in the U.S. was effectively the same in the seventeen year period between 1965 and 1982 as it was between 1982 and 1999, Alexander blames the sideways performance of equities during the first of these periods on a negative inflationary monetary environment. Conversely, markets boomed in the latter period because of a better monetary environment. Let's take a closer look at this 17-year cycle Alexander so adroitly discusses, but then fails to expand upon. More precisely, one may believe it is actually a 17.2-year cycle. Why 17.2 years? Well, here one should mention the work of Martin Armstrong who, by measuring the average distance between market panics through the 19th and 20th centuries, believed that he had discovered a cycle he referred to as the Princeton Economic Confidence Interval of 8.6 years. 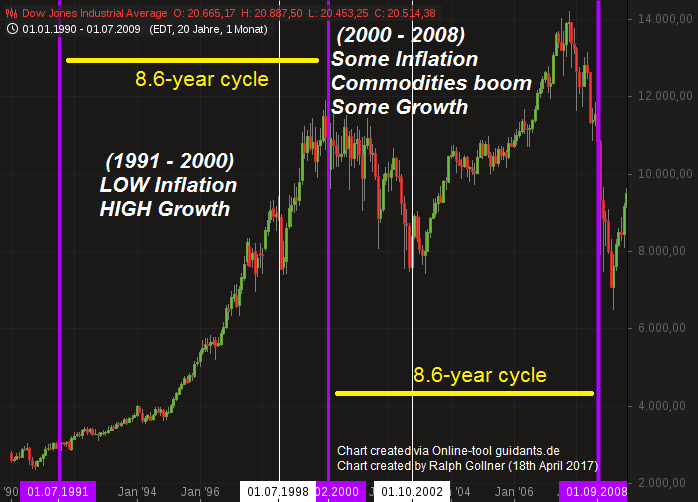 He believed that multiple 8.6 year cycles in the markets existed that build in intensity to form a long-wave of economic activity measuring 51.6 years. Now 8.6 years happens to equate to 3,141 days which is pretty damn close to the mathematical value of pi (3.14159) times a thousand. Twice pi times 1,000 is 6,283 days or 17.2 years. Well, assume r, or the radius, is equal to a base unit of 1. This equation would then reduce to just 2 *PI, or in our thought process, the circumference of a circle equating to the completion of one full cycle. Pretty neat, eh? After all, if concepts like calculating the circumference of a circle hold in the physical world of geometry, why shouldn't they hold in the financial world of Wall Street? Longer term, the next 17.2 year cycle would then start on 7th May 2017 and fall in July 2034, which coincidentally perhaps, is 314 years (PI again) from the 1720 South Sea Bubble.